The Director General of NEMA, Engr. Mustapha Maihaja made the disclosure when his agency hosted the monthly meeting of the Forum of Spokespersons of Security and Response Agencies (NEMA). 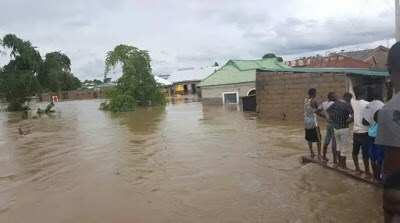 He said casualty have been recorded in several Nigerian states following heavy rains that caused the Rivers Niger and Benue to overflow. The worst affected states are Benue, Kogi, Niger, Kwara, Anambra, Delta, Bayelsa, Rivers, Adamawa, Kebbi and Taraba. He said proactive intervention measures instituted prior to the occurrence of the flood have prevented the situation from aggravating to the point of the 2012 disaster. He added that even the United Nations Humanitarian Coordinator in Nigeria has commended the proactive measure of his agency. “Though concerns have been expressed over a possible repeat of the 2012 flood disaster in some states when the River Niger overflowed its banks, displacing many residents, this year we are able to manage it. “When the agency received the forecast of high rainfalls and likelihood of the heavy flooding, immediately mobilized the stakeholders in preparing ahead with all necessary resources for preventive interventions. This mitigated against the worsening of the situation as most of the communities at risks were evacuated to safer higher locations ahead of the rising water level from the rivers. “With presidential directive, the agency also declared national disasters in the initial six worst affected states and immediately created Emergency Operations Centres (EOCs) with officers deployed to coordinate the interventions. He applauded the creation of the spokespersons’ forum of Spokesperson of Security Agencies and charged the members to assist in building cooperation among the government agencies in information management Speaking earlier, the Chairman of FOSSRA and Director of Defence Information, Brigadier General John Agim commended NEMA boss for his result-oriented commitment on restructuring, repositioning and reorganisation of emergency risk reduction strategies in the country. General Agim said the spokespersons’ forum has continued to achieve its objectives in promoting solidarity among the member agencies and reducing conflicts and rancour in the management of public information in Nigeria.